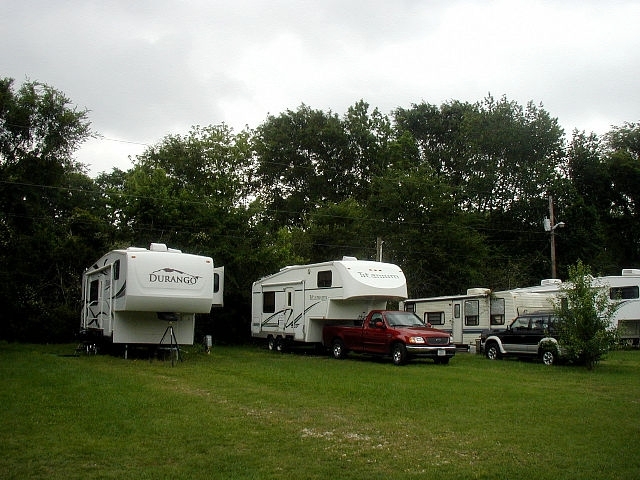 This was our first two-week RV expedition for 2009. 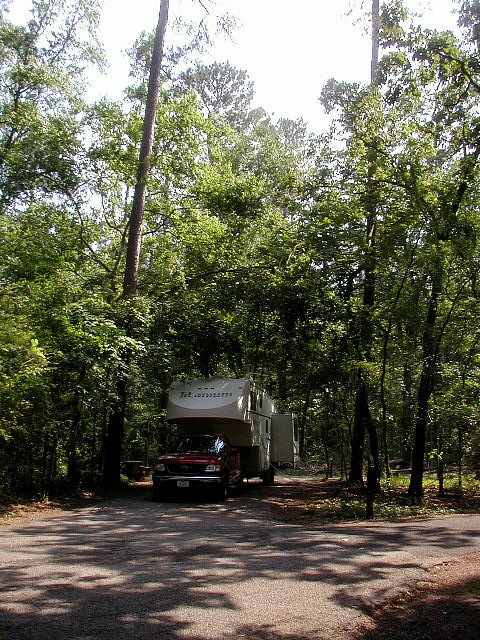 Our route took us northward on US-59 from Richmond to as far north as Caddo Lake State Park near Marshall. We stopped in Lufkin, Nacogdoches and Marshall going to Caddo Lake. 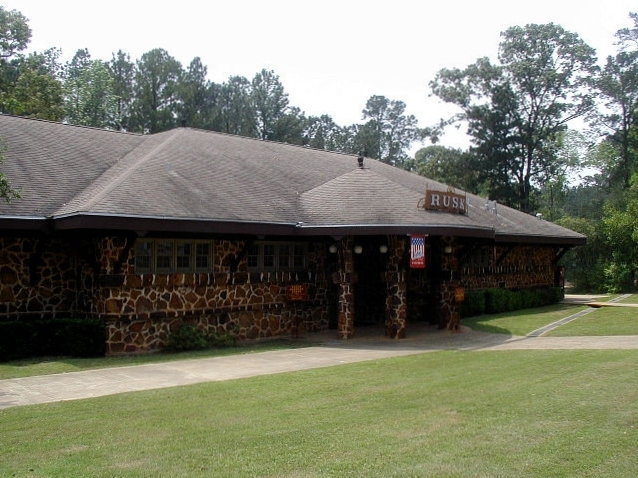 On the way back home, we stopped in Rusk at the Texas State Railroad Park, Mission Tejas State Park and Ratcliff Lake Park in the Davy Crockett National Forest. The weather was cool and rainy for the first week, but as we moved back south of IH-20, we started running into the south Texas heat again. [Wednesday] April 29th we took US-59 north from Richmond to Lufkin, where we stopped for our first night at Diamond D RV Park. This small park is mostly populated by a few permanent residents. It is about 2 miles off the Loop 287, so is convenient for knocking around Lufkin. Not much to look at, but has full hookups. After getting settled in, we drove to the Chamber of Commerce and picked up information on the area. We drove through the downtown historic district, then to Kit McConnico Park to check out the Lost Arrow Biking and Hiking Trail for possible use. After all the rains of Tuesday, we decided the trails were probably too wet for now. We returned to the trailer and enjoyed supper. [Thursday] After breakfast, we drove to the downtown historic district of Lufkin and walked for a few blocks along the historic walking tour. Placards along the sidewalks give colorful details of Lufkin's history. There are five beautiful murals by Lance Hunter on various buildings. 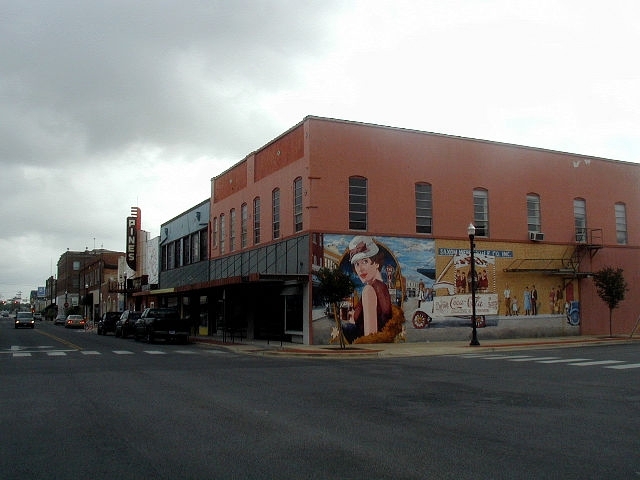 The old Angelina Hotel was built in 1922 for $200,000. 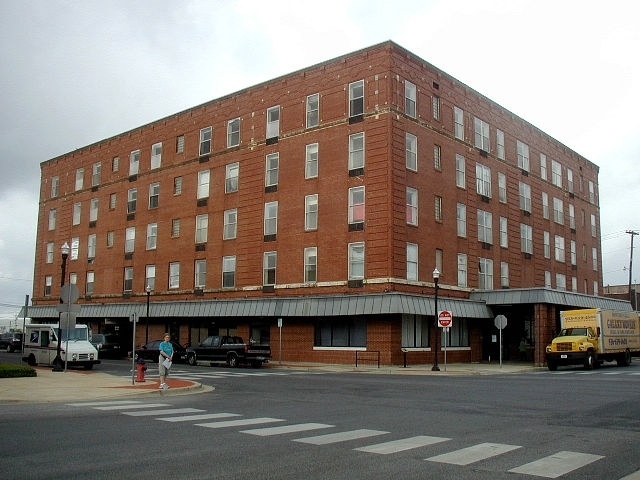 It was quite excellent in it's day, but ironically as we passed by and peeked into an open door, one of the current occupants said that the building had been condemned as unsafe because of mold, and the residents living there had to move out. It was being used as an apartment building. The guy's moving truck was outside being loaded. 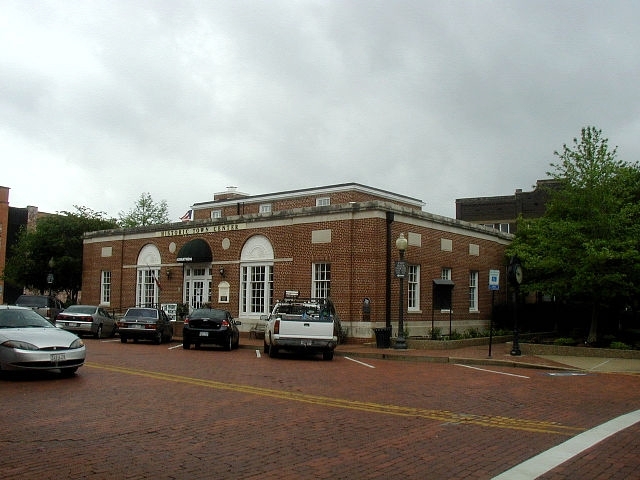 A few of the old downtown buildings have been restored, but many are still in disrepair. There are signs of downtown revival, but they have a long way to go. < Lance Hunter murals. < Angelina Hotel. After lunch at the trailer, we hooked up the trailer and drove to the Texas Forestry Museum. We spent about two hours touring the museums inside and outside displays. 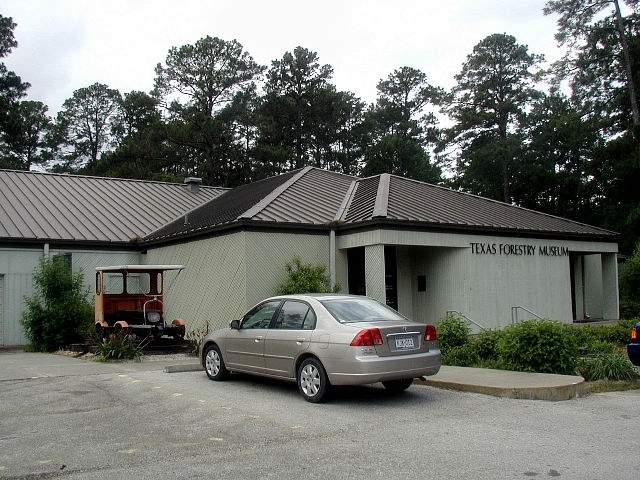 It is the only museum of its kind in Texas, and features exhibits that include a Paper Mill room, sawmill town exhibit, logging locomotive and depot, forest fire lookout tower and Urban Wildlife Trail. 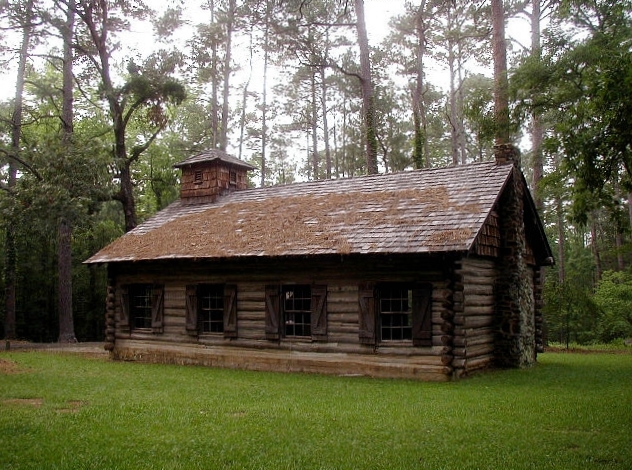 < The Texas Forestry Museum. 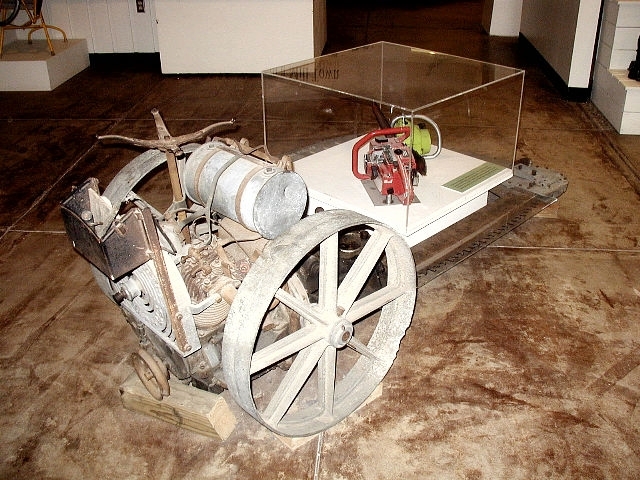 < Chain saw display. 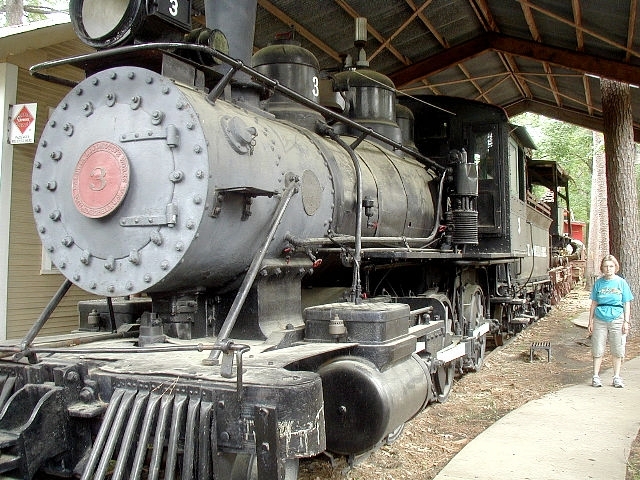 < 1908 Baldwin Logging Locomotive. 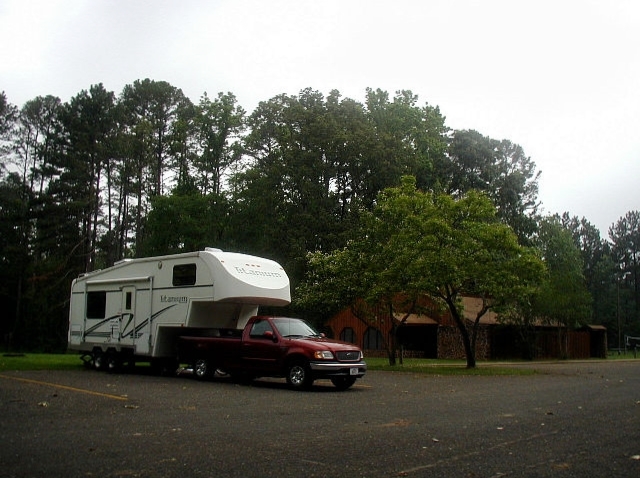 We then drove to Nacogdoches, the Oldest Town in Texas, and set up camp at Village Park RV on US-59 north of town. This is another one of those small-town parks where most of the sites are permanent or semi-permanent folk. Not much to look at, but full hookups and OK for overnight and convenient to the town. We then drove into Nacogdoches downtown area and checked out where the Visitor's Center was located so we could pick up brochures next morning. [Friday] After breakfast we packed a lunch and drove to the Visitor's Center. We picked up the brochures and toured their nice little history museum. 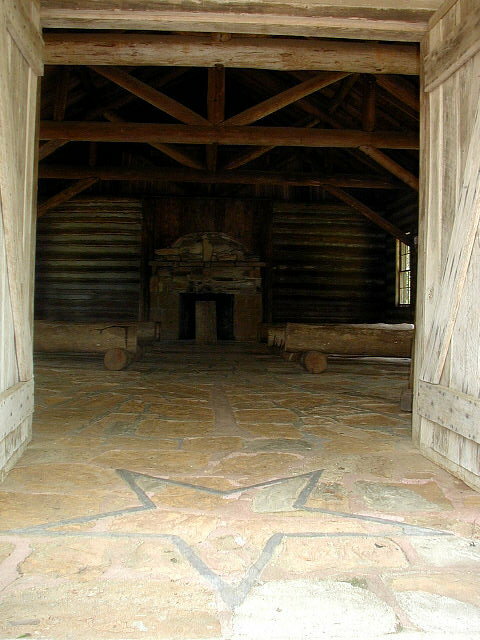 It told about the Caddo Indians that were in the area before the Spanish and French arrived. We then received a very good guided tour of the Durst-Taylor Historic House & Gardens. 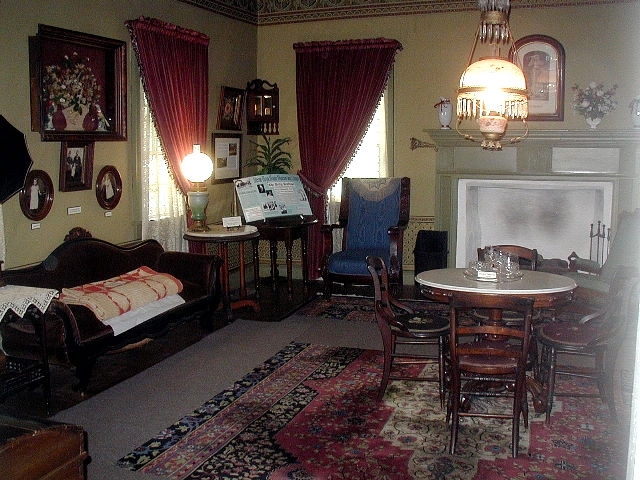 The house was built in circa 1835 and is furnished with period items. The out-buildings are reproductions of building appropriate for the time. It has been home to many influential people in the development of Texas. 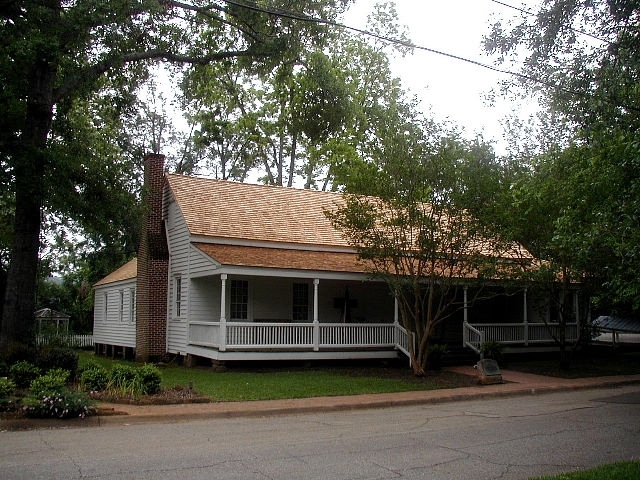 It is the second oldest dwelling existing in Nacogdoches. < Durst-Taylor House circa 1835. We then drove to the Sterne-Hoya House Museum & Library and after enjoying our lunch in the parking lot next to a beautiful blooming Catalpa tree, we received an excellent guided tour of the home. Adolphus Sterne, a prominent merchant and Texas Revolution leader, built the home. Owned by only two immigrant families since its completion in circa 1830, this structure is believed to be the oldest frame house of major historical significance still standing on its original site in Texas. 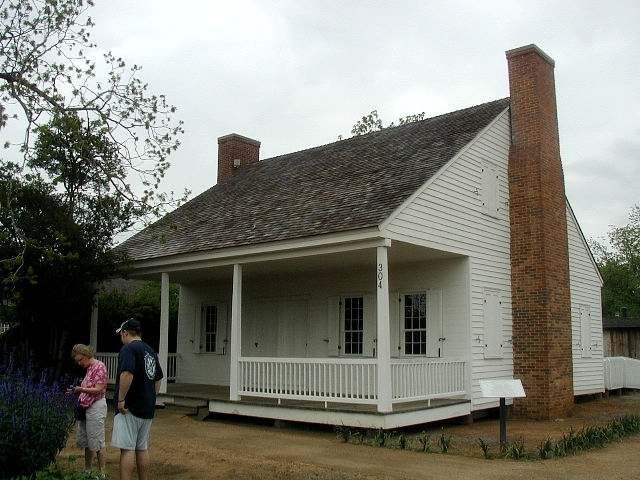 Sam Houston, hero of the Texas Revolution and President of the Republic of Texas, was baptized in this house with Mrs. Sterne serving as his godmother. Davy Crockett and Thomas J. Rusk were also guests here. < Sterne-Hoya House circa 1830. < Sterne furnished room. < Hoya furnished room. We drove around the downtown area checking the other houses on the Walking Tour. We saw several well-maintained old houses. We decided to take a short walk down the Lanana Creek Trail that runs about two miles along the creek. 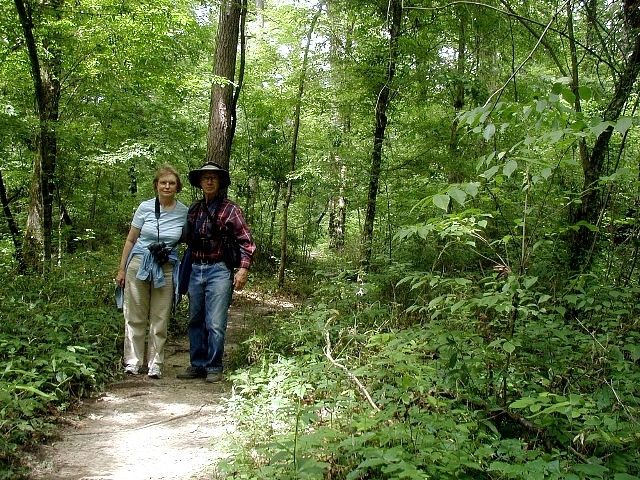 It is a nice scenic trail located in the heart of the city. 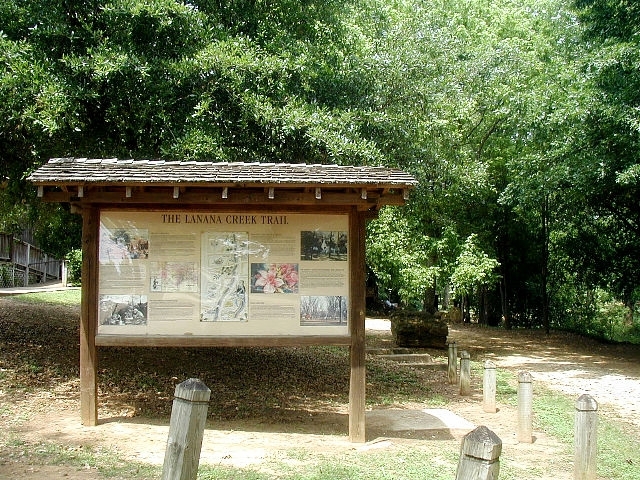 < The Lanana Creek Trail entrance from Main Street. We next toured the Stone Fort Museum, housed in a replica of the stone house built between 1788 and 1791 in Nacogdoches. 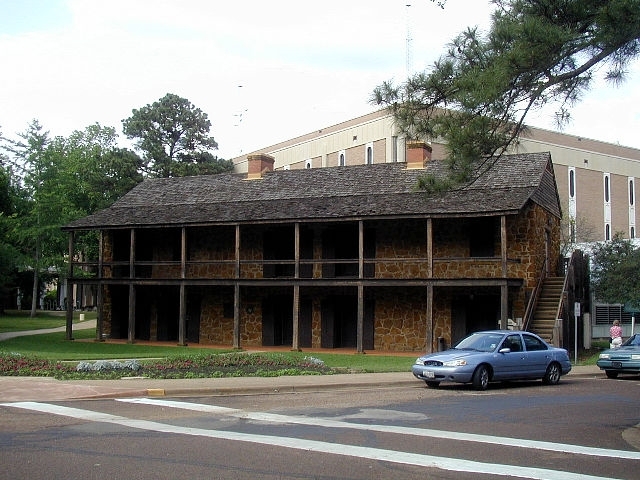 It is located on the campus of Stephen F. Austin University. 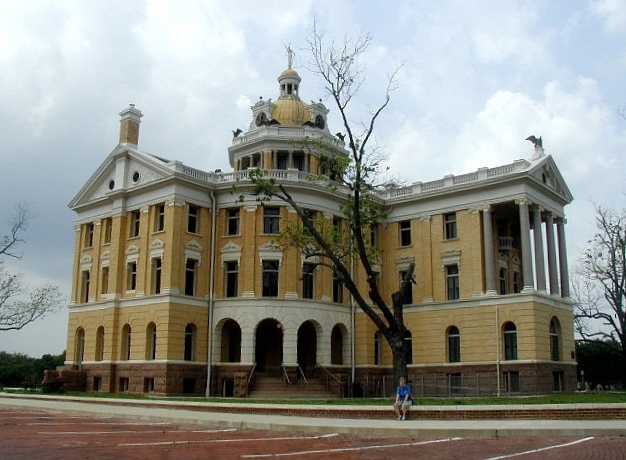 It was originally built by Don Antonio Gil Y'Barbo, the founder of present day Nacogdoches. [Saturday] After breakfast we drove into Nacogdoches expecting to see a sidewalk sale that was supposed to take place, but found nothing. 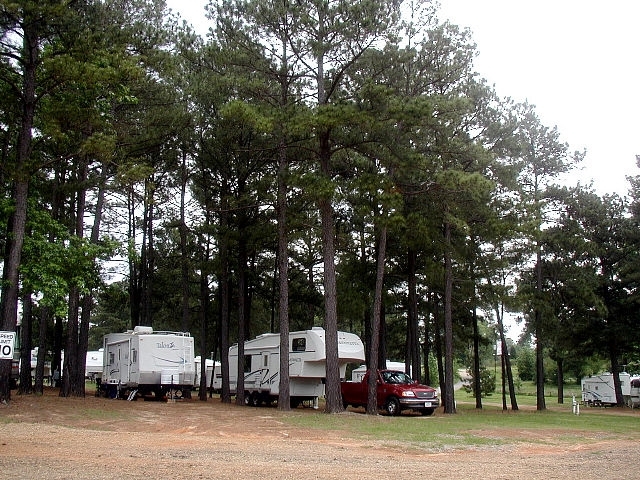 After checking the old Indian Mound on Mound Street, we hitched the trailer and headed further north on US-59 to Marshall, where we checked into Country Pines RV Park. After unhitching, we drove into Marshall and checked out the downtown, including the historic courthouse that is currently being renovated inside. 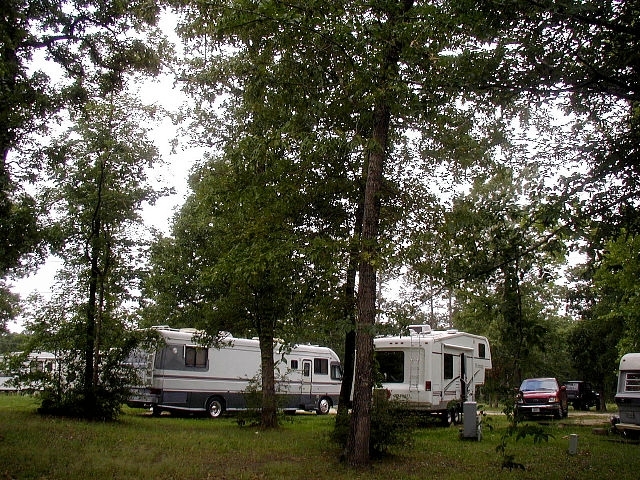 < Country Pines RV. < Harrison County Courthouse. Saturday night the television was warning of heavy storms across northern Texas extending to within about 50 miles of us. During the night we had good sleeping weather with the raindrops hitting the trailer most of the night. Early in the morning a storm moved through and left everything outside soaked. [Sunday] We sat inside the trailer waiting for the rain to stop so we could hook up and leave Country Pines RV. The rain had stopped by 11am although it was still dark and overcast (which hung around all day). 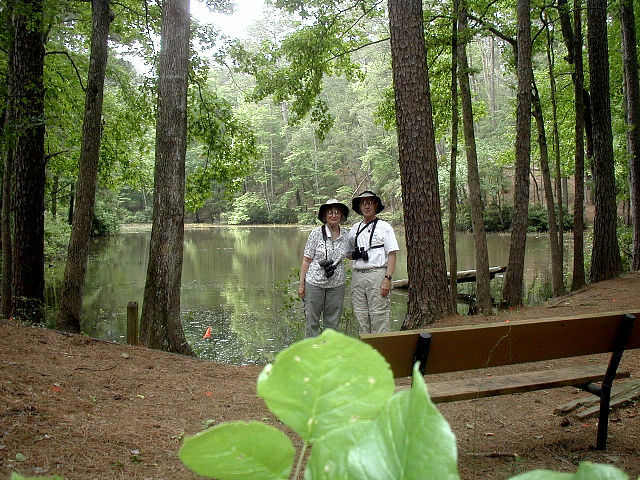 We left and after stopping in Marshall to pick up groceries, we arrived at Caddo Lake State Park around 1pm. 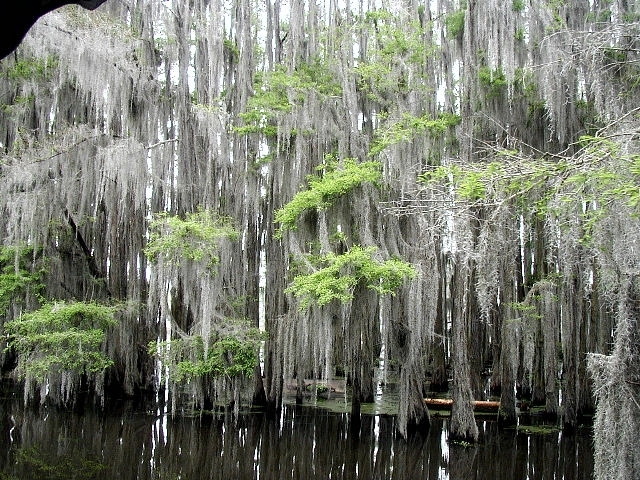 < Caddo Lake SP entrance. One of those "impossible odds" events occurred as we arrived at the park. As we got out of our truck a car pulled up and a friend of Lawson's, Ed Benya from Sugar Land stepped out. Neither of us knew the other was anywhere around. Ed was on his way home from the upper peninsula of Michigan and just drove through the park as we were entering. Ed and I are fellow volunteers in the Media Department at Second Baptist Church. God works in mysterious ways to remind us that He is still in charge! We settled into site #45 next to the Park Hosts, who were friendly and helpful. It was an excellent site very close to the water and with many birds and squirrels around. After getting the trailer set up, we went back to the Park Entrance to go through their small museum and walked around outside the area. [Monday] We needed to do some laundry to carry us til the end of the week, so we had to go back the 15 miles into Marshall to find the closest laundry matt. While in Marshall, we took the opportunity to find an open WIFI to download our email and then returned home for lunch. After lunch, we walked several of the trails (very steep) and spent some time birding. We saw two new birds for us - a Hooded Warbler and a Prothonotary Warbler. Both were beautifully colored. In addition, we saw dozens of Cardinals, Chicadees, Titmice and a Summer Tanager and others we haven't identified yet. This is looking like a great birding location. 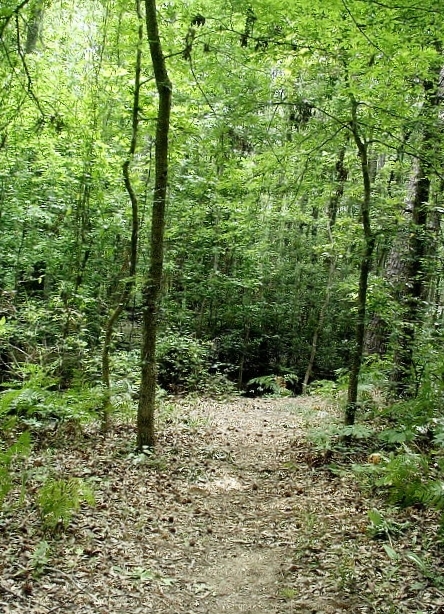 < Hiking on Caddo Forest Trail. 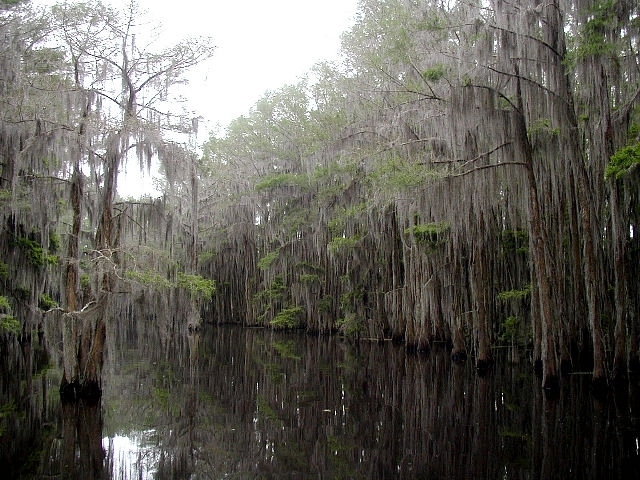 < < Views of Caddo Lake from near our campsite. At about 8pm we heard the thunder roaring nearby and we decided that a storm was coming. We were right. We are in the rainy season for North Texas! [Tuesday] The day started off cool (about 62F), overcast and gloomy. 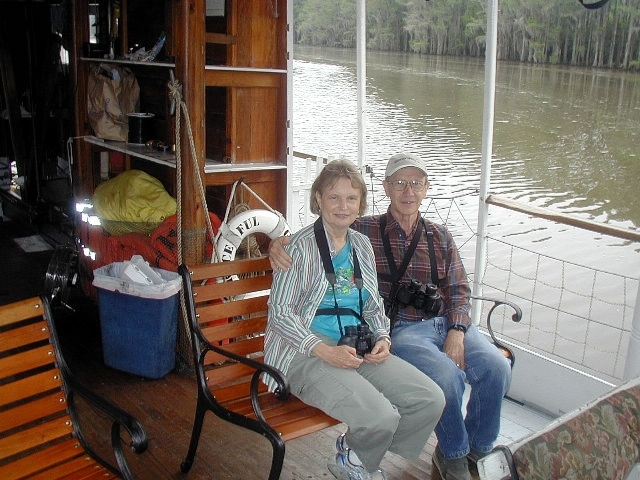 We were planning to take the Caddo Lake Steamboat Company Scenic Narrated Tour, which leaves from Uncertain, TX. We decided to walk around the park in the morning to give the sun a chance to come out for our boat tour. We walked around the camping loops and saw many familiar birds. After lunch, we drove about 6 miles to Uncertain and boarded The Graceful Ghost. 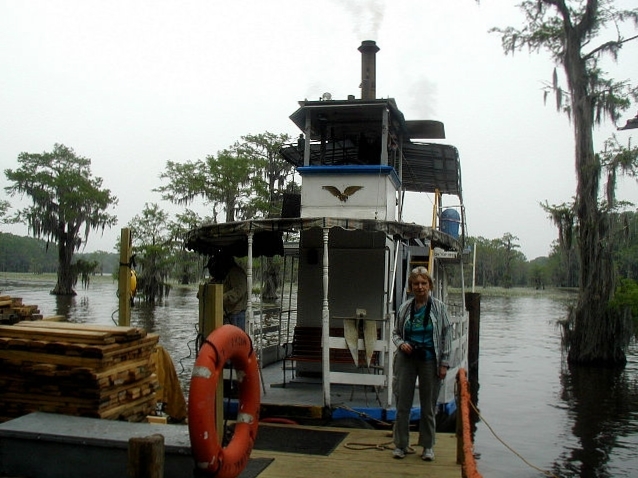 It was said to be the only wood-fired, steam-powered paddleboat in operation in the country. We enjoyed a relatively quiet (except for the chug chug of the engine) smooth ride around the lake. Due to the lake only being about 2 feet deep, the boat traveled in the marked channels which were 4 feet deep. 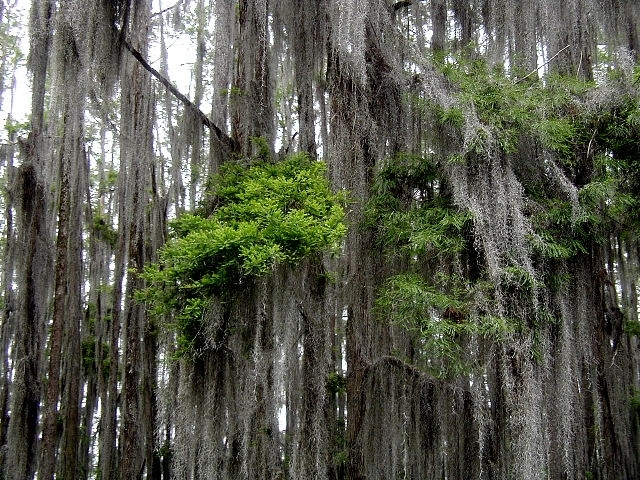 The bald cypress trees with all the Spanish moss hanging from them looked like something from a Vincent Price movie. Thankfully the rain stayed north of us this day and even though we didn't see the sun, it was a nice cool day. The high was only about 73F. < Kay exiting The Graceful Ghost. < Kay & Lawson on The Graceful Ghost. 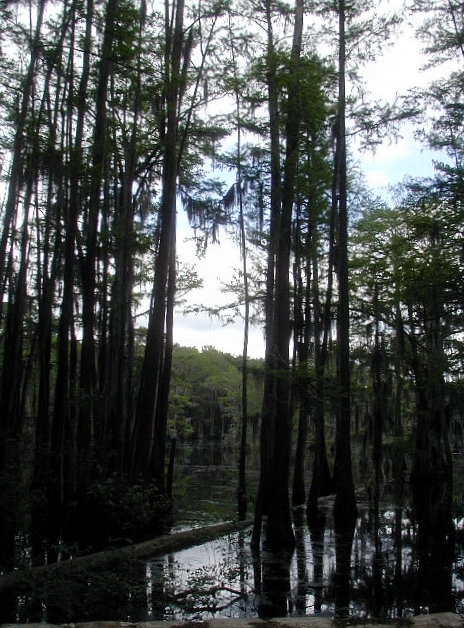 < Caddo Lake from The Graceful Ghost. After we got back into the campsite, we parked next to the canoe rental parking. 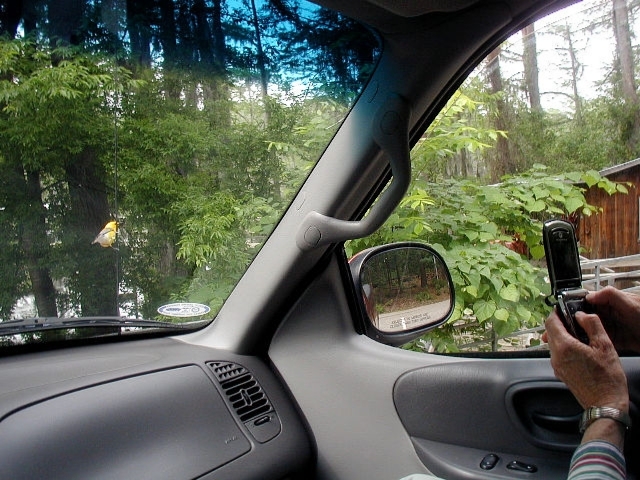 We had observed that a Prothonotary Warbler would come up to the cars parked in the lot and try to run it's reflection in the car rear-view mirror or side window away. Sure enough, shortly after we were parked he showed up. We have seen Titmice and Cardinals do the same. They really get stressed out by mirrors. [Wednesday] When we awakened in the morning it was very dark outside. By the time we had finished breakfast, the thunder and lightening was back again and the rains began. Around 9am we realized that we weren't going to get an opportunity to do anything outside anytime soon. We decided to move back south to try to escape the rains. Lawson put on his raincoat and got all the outside work completed, while Kay finished up on the inside. 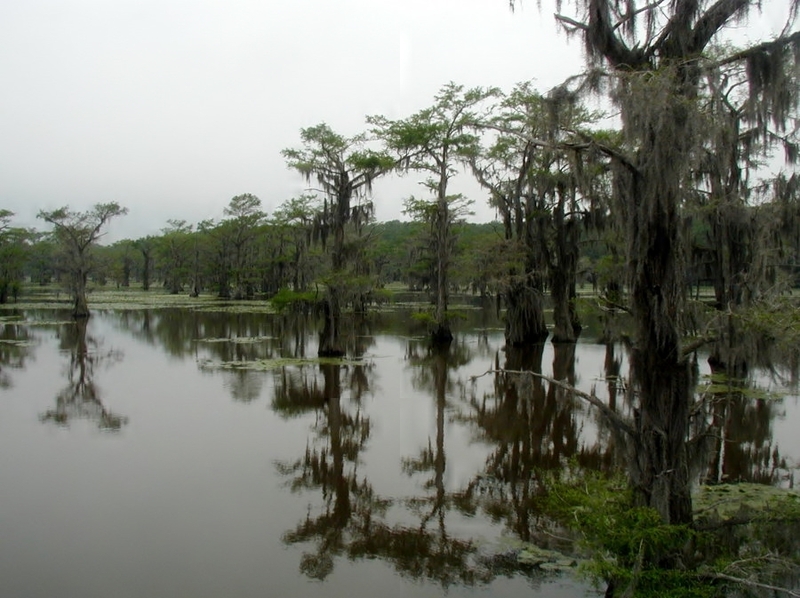 With the thunder and lightening and rain still going, we departed Caddo Lake S.P. down TX-43, US-79 and US-69 to Rusk, and the Texas State Railroad Park (formerly Rusk State Park). By the time we arrived the rain was left behind, but it was still overcast. < Campsite at Texas State Railroad Park. After setting up camp in the park, we road our bicycles around all the camp roads. After supper, we took a walk around again. [Thursday] After breakfast we walked the nature trail that goes through the woods next to the campground and ends over at the Depot. The trail also goes along the shore of the fishing lake. < Nature Trail. < Fishing Lake. After checking out the Depot (which was closed), we decided to walk down the track to where they store the train engines and cars. When we got near the engine shop, we saw someone motioning for us to come closer. 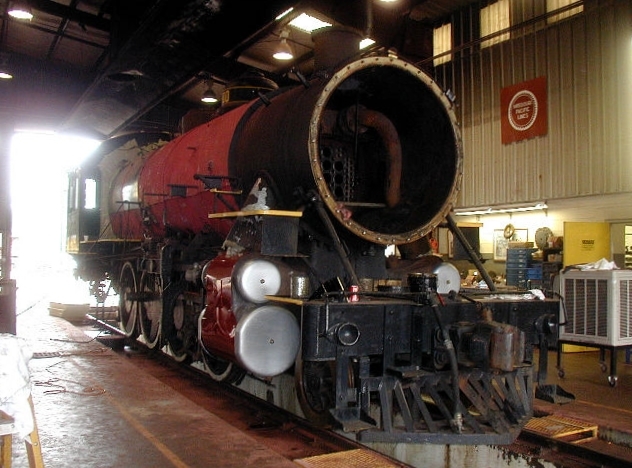 He was the shop manager and was very hospitable and showed us the steam engine #300 that they were rebuilding, as well as some maintenance on other rail cars. It was very informative and interesting. < Rusk Depot. 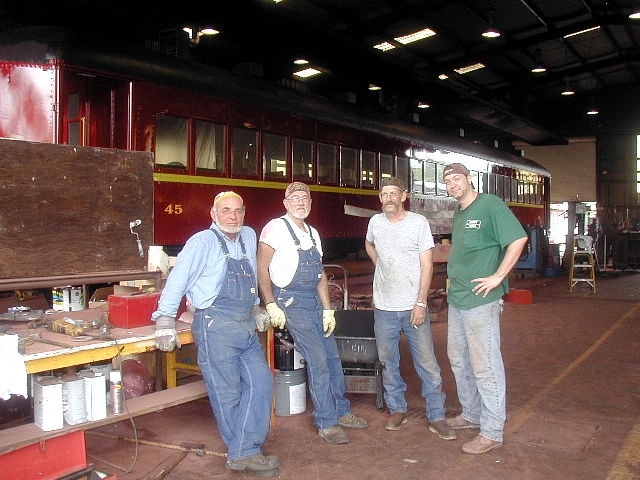 < The men that keep the trains running. < Engine #201. < Engine #300 being rebuilt. < Rail yard. 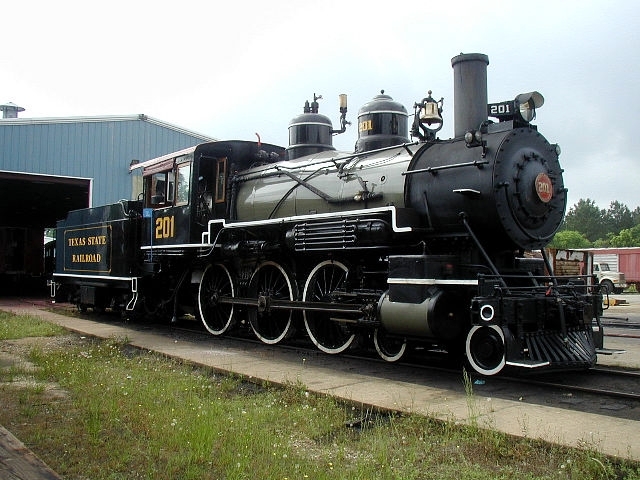 After lunch we departed from Texas State Railroad Park and drove through Rusk to US-69, then south to Alto. There we took TX-23 west to Caddoan Mounds State Historic Site. 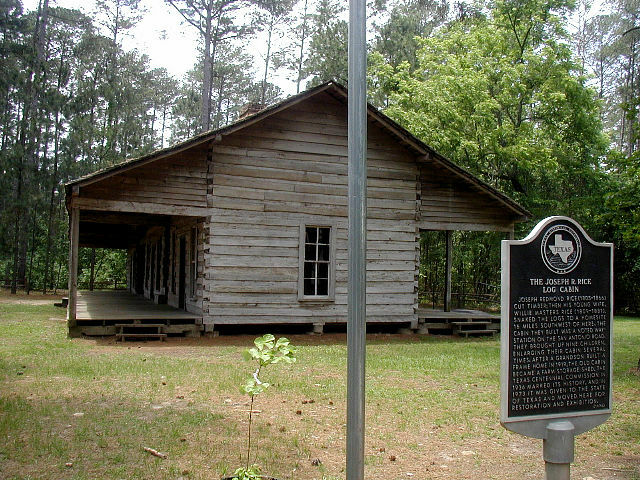 This Texas Historical Commission site has a Museum detailing the Caddo Indian history and life. 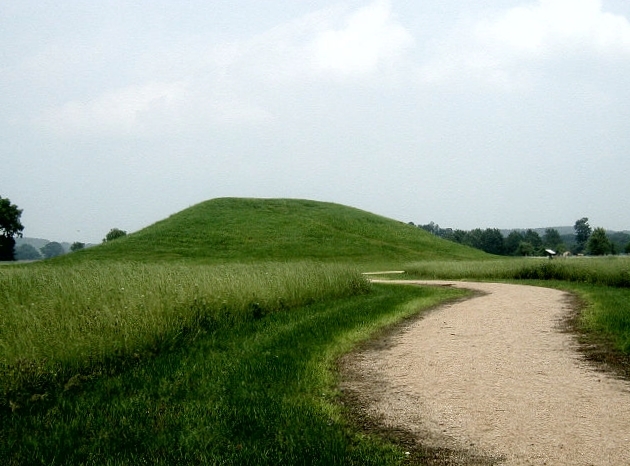 On the site is an interpretive trail that goes by a Burial Mound and a Low Temple Mound. < Caddo Indian Burial Mound. Down the road about 6 miles was Mission Tejas State Park. We decided to camp there for the night. We checked into site #10 and were the lone campers in the park that night. < Mission Tejas State Park. < Alone in the park. After supper we walked up the hill to the Commemorative Mission that was constructed (along with the park) in 1934 by the CCC. The original Spanish mission was built in 1690 among a village of the Nabedache Indians. The Spaniards called them "Tejas," the natives' term for "friends," and called this area "Land of the Tejas," later shortened to "Tejas," or "Texas." [Friday] After breakfast we walked down some of the trails. 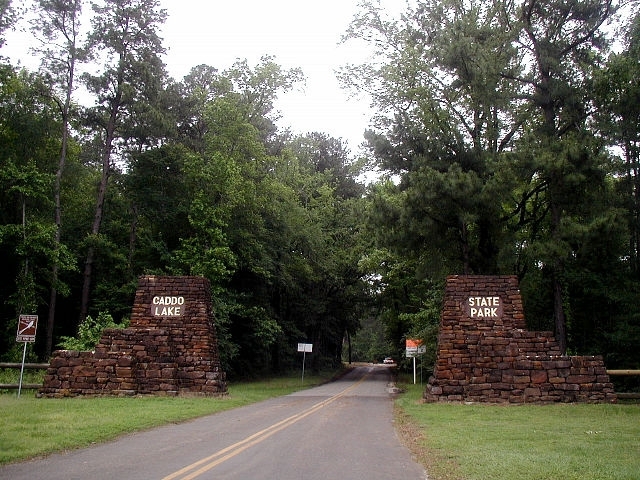 The Old San Antonio Road and El Camino Real de los Tejas pass through the park. 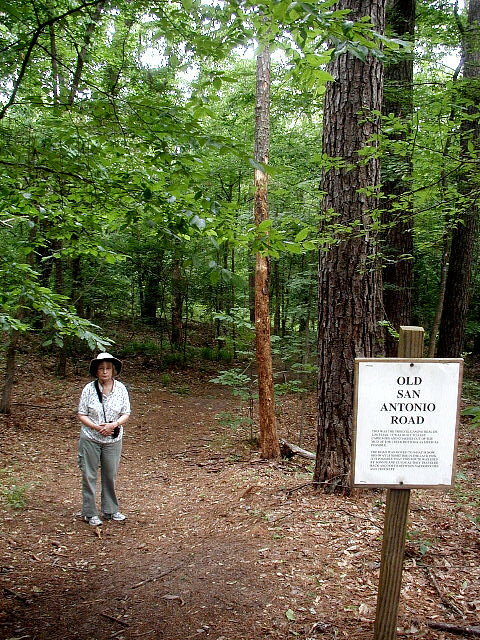 We walked along the old road used by famous Texans such as Stephen F. Austin, Jim Bowie, William B. Travis, Sam Houston, Davy Crockett and Cynthia Ann Parker. We then walked the Nature Trail that goes around the small pond. The trails go through the pine forest, up some steep hills. 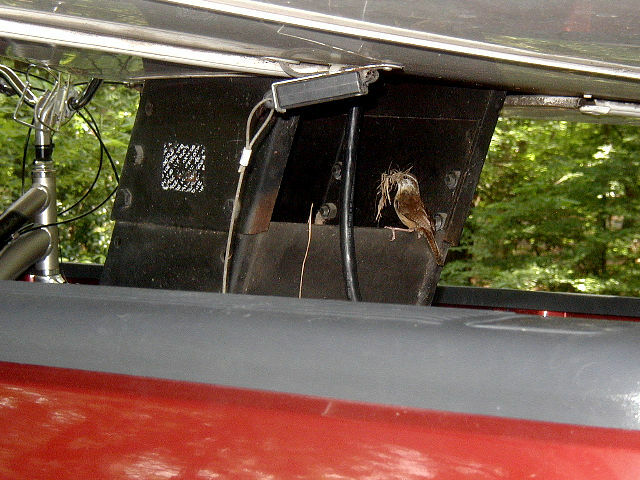 We returned to the trailer to discover a pair of Carolina Wren had decided to start building a nest in our hitch box. We assumed they wanted to see some of the world via RV. < Old San Antonio Road. < The pond. < Carolina Wren. After lunch, we stopped at the Rice Family Log Home on the way out of the park. 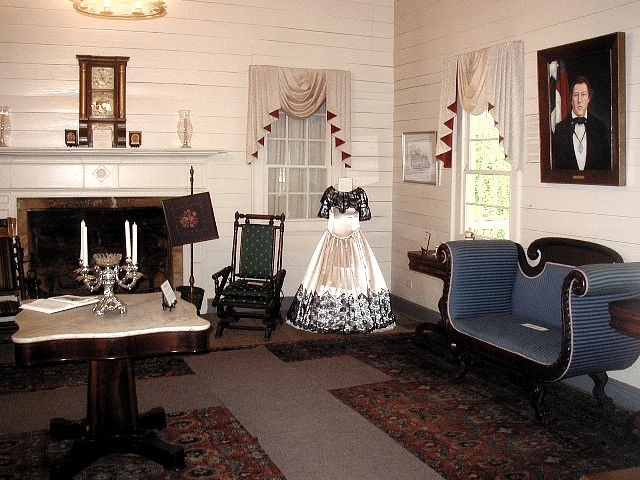 The oldest room of the house was built in 1828 and served as the home to the Joseph and Willie Masters Rice and their large family. The home was also a stop for travelers on the El Camino Real de los Tejas. < The Rice Family Log Home. 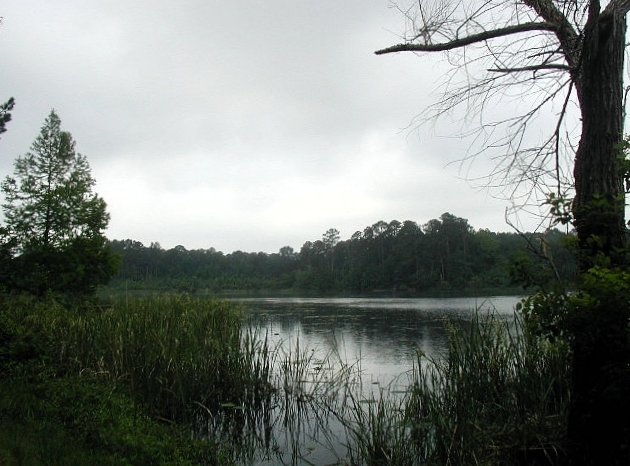 About 15 miles south was our next stop in the Davy Crockett National Forest at Ratcliff Lake. 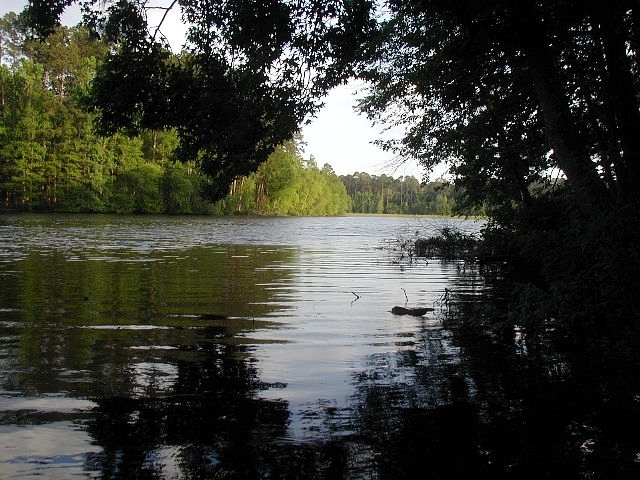 This is a nice NFS park with a beautiful clear lake with a sandy bottom. We checked into site #30 right next to the Park Host, among the tall trees. After supper when the temperature had fell from the upper to the lower 80's, we took a walk around the camping loops next to the lake. 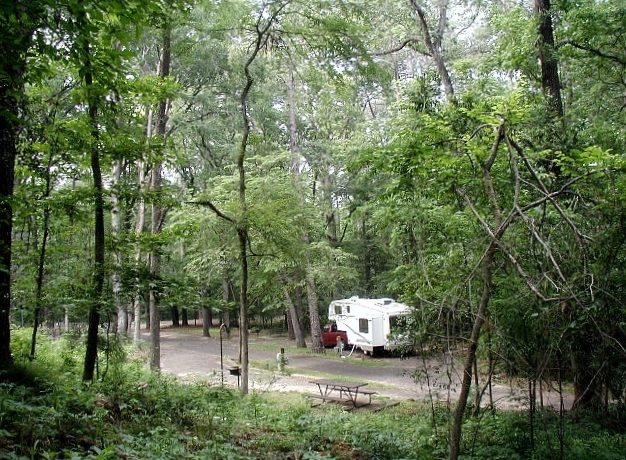 < Our Ratcliff Lake campsite. < Ratcliff Lake. [Saturday] In the morning we hiked some of the trails in the park. We took the Tall Pines trail until it intersected with the Four C Trail, then along the Four C until we reached FSR 521, then west until the road intersected the Tall Pines trail. 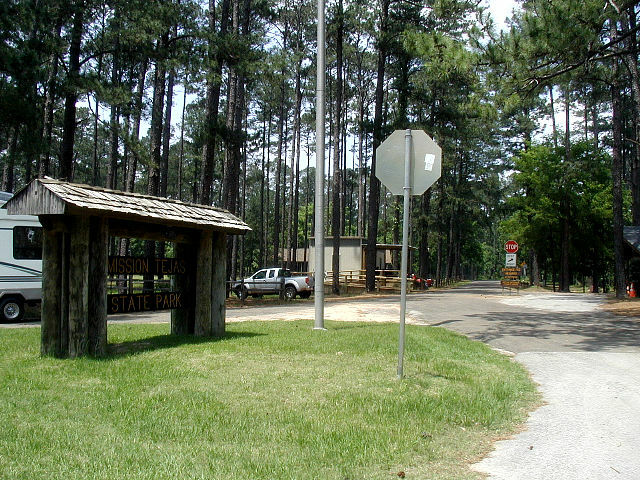 The Four C National Recreation Trail is 20 miles and originates at Ratcliff Lake and goes to the Neches Bluff Overlook. After we returned to the trailer and had lunch, we took a back way home to Richmond. 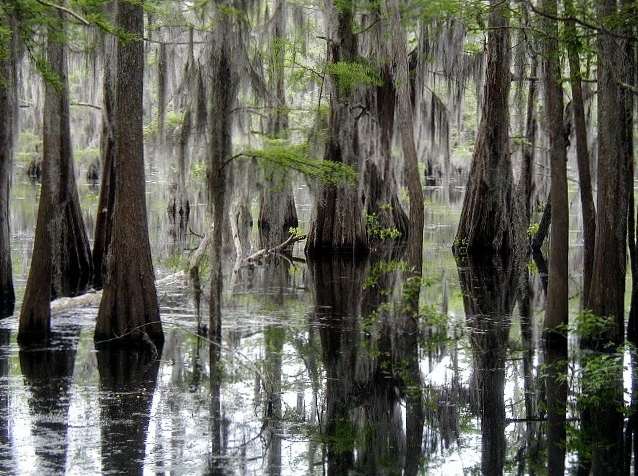 This draws to a close our visit to Caddo Lake and the Piney Woods of Texas. We hope you enjoyed the photos and brief descriptions of our activities. God willing, join us again soon for another RV adventure.